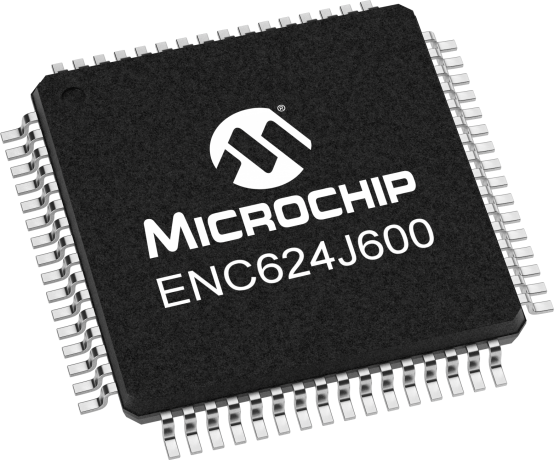 Microchip's ENC624J600 offers low-cost stand-alone 10/100 Base-T Ethernet interface controller with integrated MAC & PHY, hardware cryptographic security engines and factory preprogrammed unique MAC address. A 24-Kbyte on-chip RAM buffer is available for TX and RX operations. The ENC624J600 have an industry standard Serial Peripheral Interface (SPI) or a flexible parallel interface. They are designed to serve as an Ethernet network interface for any microcontroller equipped with SPI or a standard parallel port. Microchip’s ENC624J600 enables designers to create secured network- and Internet-connected embedded applications with minimized board space, cost and complexity.